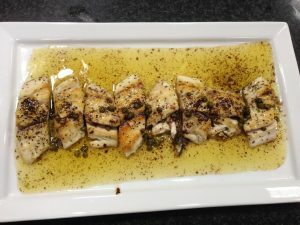 A past dish prepared at Central Market Cooking Schools. Learning to cook can be fun, especially when you attend a Texas Parks and Wildlife / Central Market Cooking School wild game and fish class. We joined forces to introduce non-hunting and fishing food enthusiasts to the joys of wild proteins, and to help hunters and anglers learn a few new culinary tips and tricks to get the best flavor from the animals they harvest. We hold classes the second Tuesday of every other month; we have one coming up in March. The recipes will have a tropical twist this time around, and feature crab, wild boar and shrimp with the flavors of coconuts, plantains and luscious fruits, like pineapple. At each class a TPW volunteer shares information about wildlife management and conservation in Texas. Classes take place in Austin, Houston, San Antonio, Fort Worth, Dallas, Plano and Southlake. Find a link to the locations, full class description and menu, as well as how to register at passporttotexas.org. 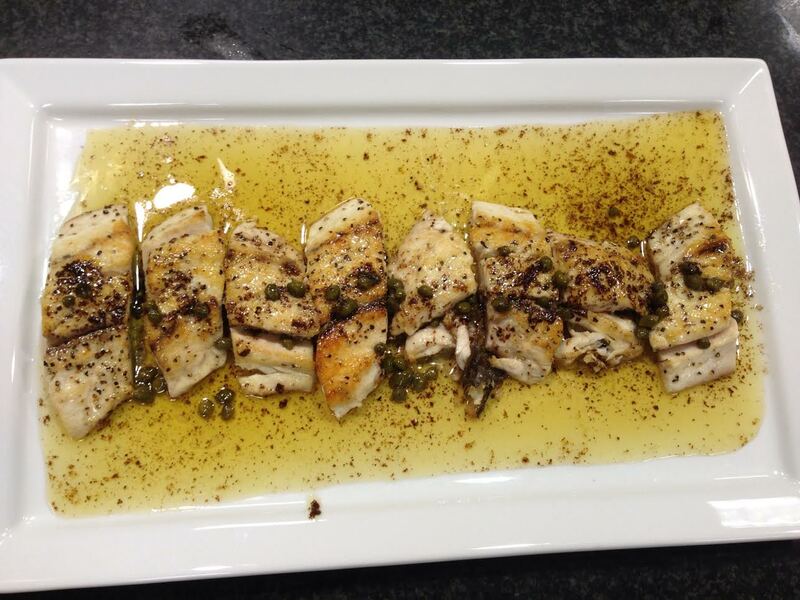 And you can also find wild game and fish recipes on the Texas parks and Wildlife website. We record our series in Austin at the Block House, and Joel Block engineers our program. We receive support for our show in part from RAM Trucks: built to serve. Class registration is simple. Just go the Central Market Cooking School main page, find the school in your area, click on the link, and then search the calendar for the TPWD class. Follow the directions and you’ll be all set. 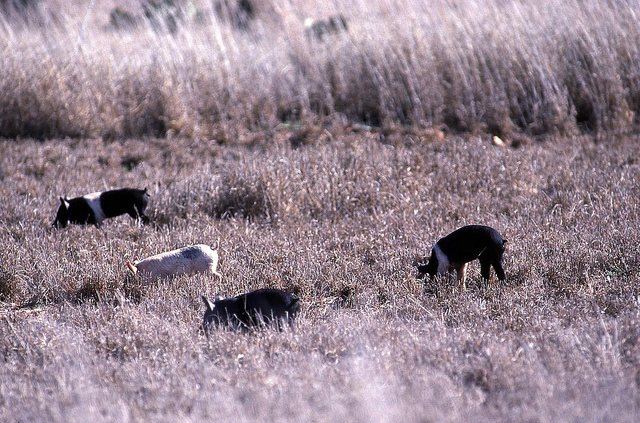 Trapping and hunting are not effective controls against feral pigs. These methods have not been able to reduce the geographic spread and the increase and abundance of feral pigs in our state, nationwide, and – I’m sorry to say – globally. Justin Foster, research coordinator at TPWD for region two, says we need new tools to combat the pigs. The agency is evaluating sodium nitrite based pig toxicants. What we don’t have is a tremendous amount of information that tells us that we can deliver any pesticide safely, reliably and humanely. They’re collecting that data now. During one field test the pigs dropped baits, perhaps detecting a difference between the placebo and poison versions. This lead to unintended costs for passerine birds. And so, as this bait was being dropped, and those feral pigs were going back to the feeder to try some more—it wasn’t so bad that they weren’t trying more—they were trampling the bait that had been dropped. And that bait had some grain in it. We assume those passerine birds were targeting that grain. Researchers do not take such losses lightly, and continue to work on a reliable and humane protocol. The Wildlife Restoration program supports our series and funds the development of toxicants and delivery strategies for controlling feral hogs in Texas. 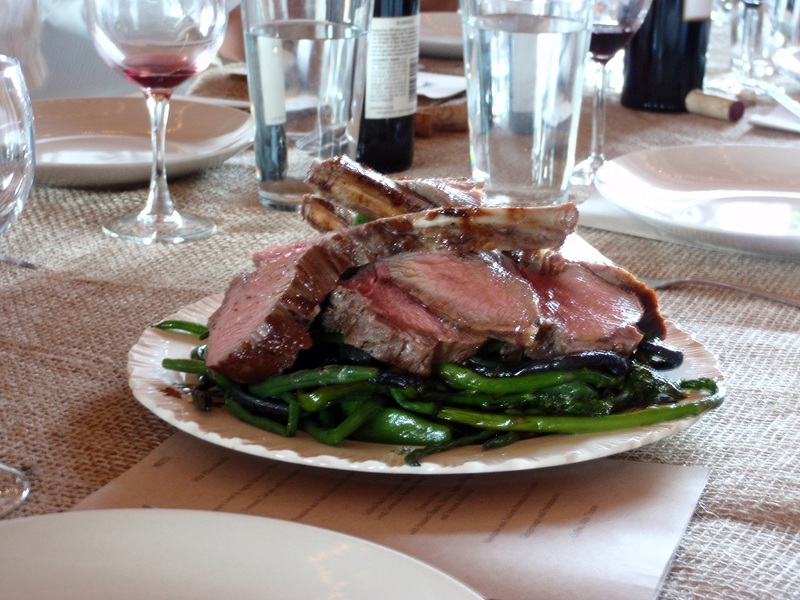 Jack Gilmore says working with wild game helps him to “up” his chef game. Hunters call them feral pigs. Chefs call them wild boars. Names don’t matter as long as the end result is delicious. We use wild boar for a lot of chilis and things like that. Feral pigs cause millions of dollars in damage to cropland in Texas, and tear up wildlife habitat, too. 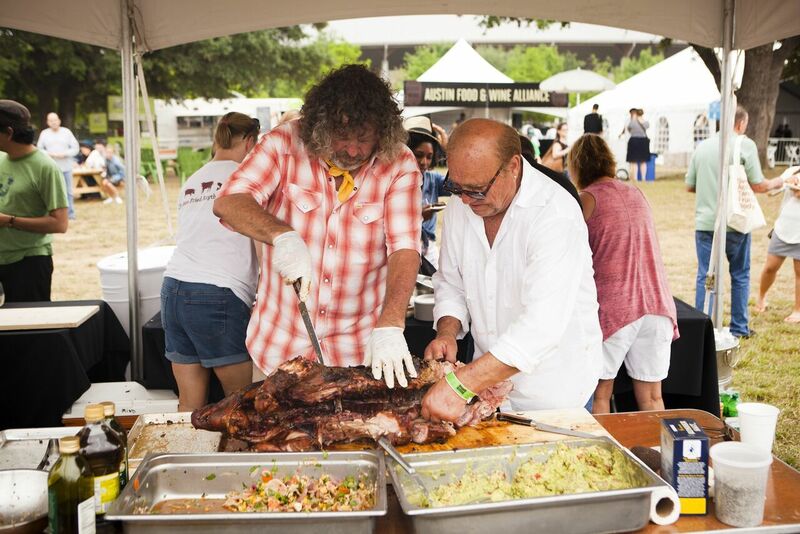 Chef and restaurateur, Jack Gilmore serves game dishes at his namesake restaurants Jack Allen’s Kitchen in Austin and Round Rock, and says cooking wild boar offers challenges and rewards. You really can’t write a recipe for it, because each time it’s different because it’s wild. It might be a little gamier, or a little fatty – or it may not have enough fat in it. You really have to be a chef again and say: ‘Well, if it doesn’t have enough fat in it, we could add bacon to it. If it has too much fat in it, we have to render it.’ You never know what a wild boar eats. You just don’t know. But, if they’re raised in the Hill Country, you know they’re eating persimmons; you know they’re eating acorns; you know they’re eating pretty good. But, sometimes you just have to realize what you’ve got and make it taste good. Braising feral hog meat in the oven on low heat over a long period of time creates a tender and tasty result. Find wild game recipes on the Texas Parks and Wildlife website. This time of year hunting seasons begin to overlap: quail….duck…deer…you get the picture. As a result, hunters—and those of us who benefit from knowing hunters—end up with freezers full of game meat. There are worse problems to have. With the holidays on the horizon, wouldn’t a dish featuring game be a nice addition to your feast? Heck, even the Great British Baking Show had their contestants bake festive game pies. If you’re stumped when it comes to preparing wild proteins for the holiday table…perhaps a little hands-on cooking class can set you on the right course. Texas Parks and Wildlife collaborates with Central Market Cooking Schools statewide to offer hands on wild game and fish cooking classes to the public. November’s class is all about dressing up game for the holidays. Class participants will prepare: Grilled Quail with Red Chile Honey Glaze…Whiskey Spiced Duck with Swiss chard & celery root…and Venison Filet with Blueberry Pan Jus on Cheese Grits. Tell me that doesn’t sound like a party waiting to happen. The next class is November 14, and takes place in Austin, San Antonio, Houston, Dallas, Fort Worth, Southlake, and Plano. All locations are currently accepting registrations. To coax the best flavor from deer hunters will harvest this fall, proper care from field to plate, is a must. Just ask Marcus Paslay [paz-LAY]. He’s chef and owner of Clay Pigeon Food & Drink in Fort Worth. Clean and less gamey, but not without some gaminess. Find Chef Marcus Paslay’s recipe for coffee rubbed venison loin is in the October issue of Texas Parks and Wildlife magazine. You are currently browsing the archives for the Feral Hog category.